There are many cases in which the costs of a loved one drowning can be overwhelming, both in terms of monetary and emotional grief. The law allows family members to recover compensation for the damages they have experienced. These include hospital bills, funeral costs and emotional grief. 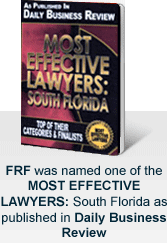 At the South Florida law offices of Friedman, Rodman & Frank, P.A., we represent the surviving families of people killed in public and private pools, as well as lakes, canals, oceans and rivers. Many of the cases we handle involve people killed while at sea. We handle these cases using in-depth knowledge of admiralty and maritime law . Drowning is one of the leading causes of childhood death in the United States. The risk of drowning can happen anywhere. While it is difficult to predict when a drowning or near-drowning accident may occur, it is relatively easy to take precautions to ensure the safety of children in the area. Pool owners should make sure that swimmers are supervised while using the pool and should provide the proper safety equipment. They should also close and lock pool gates and fences when the pool is not in use. Sadly, these things are not always done. When pool owners fail to take proper action and when drownings occur in their pools, it may be possible to hold them accountable for the death. The wrongful death claim can likely be made against the pool owner's homeowner's and general liability insurance company. Most people realize that drowning is a potential hazard whenever there is a pool around, but drowning is not the only way that people are injured in pools. Missing pool safety equipment or faulty swimming pool drains can cause serious personal injury and wrongful death. These can lead to body entrapment, hair entrapment and evisceration. Injuries may also be sustained when pool patrons slip and fall on the pool deck. At Friedman, Rodman & Frank, P.A., we understand the suffering that pool injury victims and their families experience, so we forcefully advocate for their rights in Florida courts. Accidents do not just happen during business hours. That's why we have serious injury trial lawyers available to assist you 24 hours a day, seven days a week. When you call, you will speak with an attorney who understands what you are going through — someone who can talk with you about your options and help you decide what to do. Personal injury lawyers at our South Florida law offices can communicate with you in English, Spanish and Creole. We are dedicated to making things easier for you throughout the legal process. Contact a Miami drowning attorney by calling us at 305-448-8585 or toll free at 877-448-8585 or by contacting us online to schedule a free and confidential consultation.